Listening to cardiac sound with stethoscope is part of regular check-up and for diagnosing heart problems. As a house officer, I delighted in hearing murmurs that my peers had missed, and in my first few years of practice, it seemed as though every third or fourth patient had a cardiac sound worthy of comment. 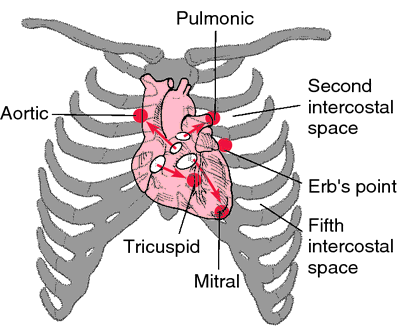 The cardiac sounds were rhythmic and a 2/6[degrees]C systolic murmur was heard. examined the ability of 78 health care providers, participants in a three-day conference on cardiac auscultation, to interpret 14 abnormal cardiac sounds recorded from actual patients and transmitted via wireless infrared stethoscopes. Cardiac sounds were rhythmic, blood pressure: 140/90 mm Hg, pulse: 76 beats per minute. Another example of virtual world training has been set up by San Jose State University in California, which has created a 'heart murmur sim' ('sim' means simulation), where students can listen to real cardiac sounds to identify heart problems. Cardiac sounds were rhythmic and there were no additional sounds. 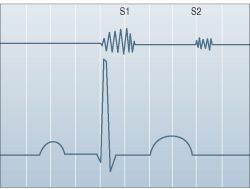 On cardiac auscultation, we heard no murmurs or abnormal cardiac sounds in the supine or standing positions. A normal heart sound (above, top) can be contrasted with cardiac sounds associated with various pathological conditions (middle and bottom). The scope pairs wirelessly with both of Zargis Medical's companion software packages: Zargis Cardioscan software supports physicians in analyzing cardiac sounds for the identification and classification of suspected murmurs, which can be signs of heart disease, while Zargis StethAssist[TM] software allows clinicians to visualize heart, lung and other body sounds, play recordings at slow speeds to hear more clearly, and save recordings for comparison to future auscultations. Physical examination revealed the following findings: general status was poor, was unconscious, pupillae were anisocoric and middalated, normal cardiac sounds, lung sounds were reduced, GCS was 6, PRISM II score was 30 (80. The scope pairs wirelessly with both of Zargis Medical's companion software packages: Zargis Cardioscan([TM]) software supports physicians in analyzing cardiac sounds for the identification and classification of suspected murmurs, which can be signs of heart disease, while Zargis StethAssist[TM] software allows clinicians to visualize heart, lung and other body sounds, play recordings at slow speeds to hear more clearly, and save recordings for comparison to future auscultations.